If Pearl Steele Cossitt is the Cossitt Family’s First Archivist then his nephew, Frederick Henry White, would have to be considered the second. Frederick is a Cossitt descendant through both his father, George Cossitt White, and his mother, Sarah Maria Cossitt, (first cousins) and was the great great grandson of Rene Cossitt and Ruth Porter through Rene Cossitt, Jr. and Phoebe Hillyar. 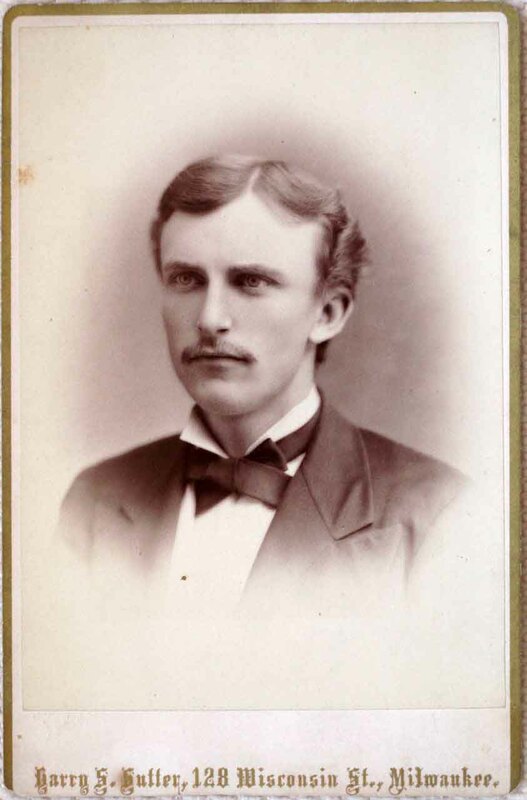 Frederick was born in Rome, New York on June 16, 1850 where his father George was involved in business with his brother. On January 1st, 1857 George became a member of the firm of Atkins, Steele and Company of Milwaukee and moved his family to that city. George’s wife, Sarah Maria Cossitt, was the sister of Rev. Pearl Steele Cossitt. As it happens, she was also the 4th cousin of Charles Steele of Atkins, Steele and Co. It is unknown if Sarah and Pearl knew of their relationship as both their mother and Charles Steele were from Hartford, CT.
Frederick grew up in Milwaukee and made his living in real estate, eventually gaining prominence as an evaluator of real estate values. His obituary states that he was the author of several books on real estate. Frederick married Frances Ludington (1856-1922), daughter of Harrison Ludington, 13th Governor of Wisconsin. A picture of Frederick as a young man is shown below. In the years 1896-1899, when Frederick was 46 to 49 and still living in Milwaukee, he applied his interest in photography by making many 4x5 and 5x7 glass photographic images, mostly of his family including his mother and first cousins Frances and Mary (May) Cossitt, daughters of the very same Pearl Steele Cossitt. These pictures may be seen at: http://whites1896-1899.blogspot.com/ He retired from business in 1909 and moved his family to Pasadena, California to live. Frederick traveled often to Europe and once around the globe. He worked on the 1925 genealogy for eight years (1917-1925) and died in Pasadena in January of 1927, only 13 months after this edition was published. Being doubly descendant from Rene and Ruth Cossitt, as well as the nephew of Pearl, it seems inevitable that Frederick would carry on the work started by Pearl. 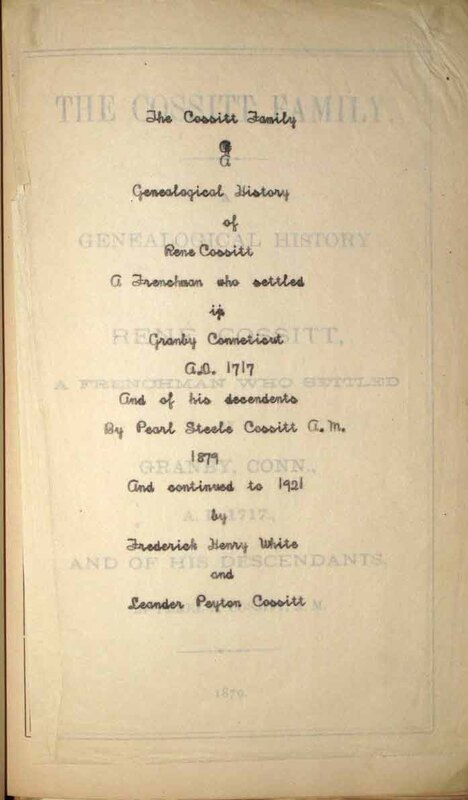 In preparing the 1925 edition of Cossitt Family: A Genealogical History of Rene Cossitt, a Frenchman Who Settled in Granby, Conn., 1717, and of his descendants to 1879 By Pearl Steele Cossitt, A.M. 1879 and continued to 1925 by Frederick Henry White and Frederick Briggs Stebbins Frederick first prepared an interim volume with the same title but with the addition of Continued to 1921 by Frederick Henry White and Leander Peyton Cossitt. This unpublished volume consists of the 1879 edition rebound with many new pages inserted, all extensively covered with handwritten notes and many tissue pages containing typed revisions pasted in. The title page of this work is shown below. 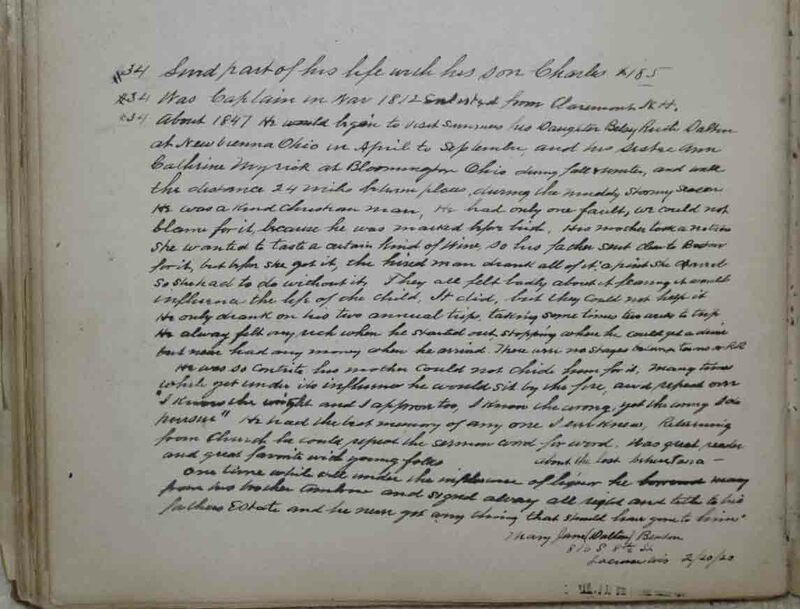 Additionally there are thousands of handwritten comments correcting and extending the information in the 1879 edition (samples also shown below). This version was never published. Rather, in 1925 the published version appeared, this time with the original title as above but this time with the addition of Continued to 1925 by Frederick Henry White and Frederick Briggs Stebbins. The contributions of Leander Peyton Cossitt were acknowledged in the Preface to this 1925 published edition. The 1925 edition extended the six generations and 452 numbered individuals in the 1879 edition to eight generations and 2019 numbered family members. 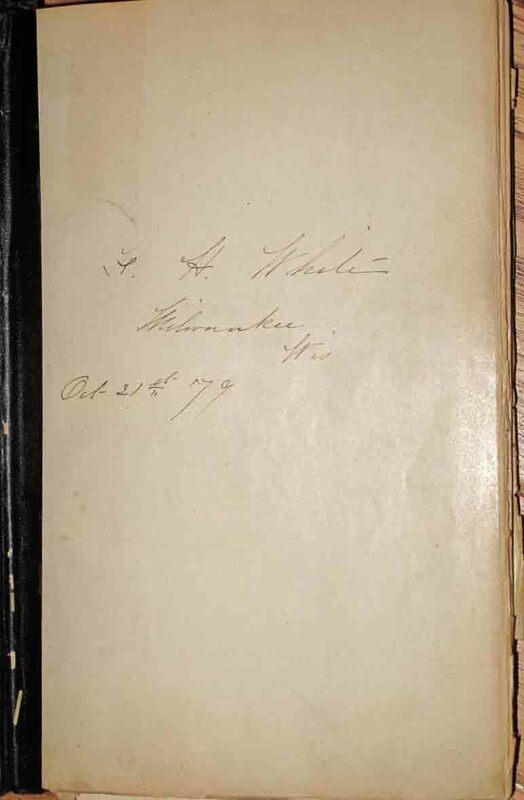 The inside cover page of the “first copy” of this edition is shown below. 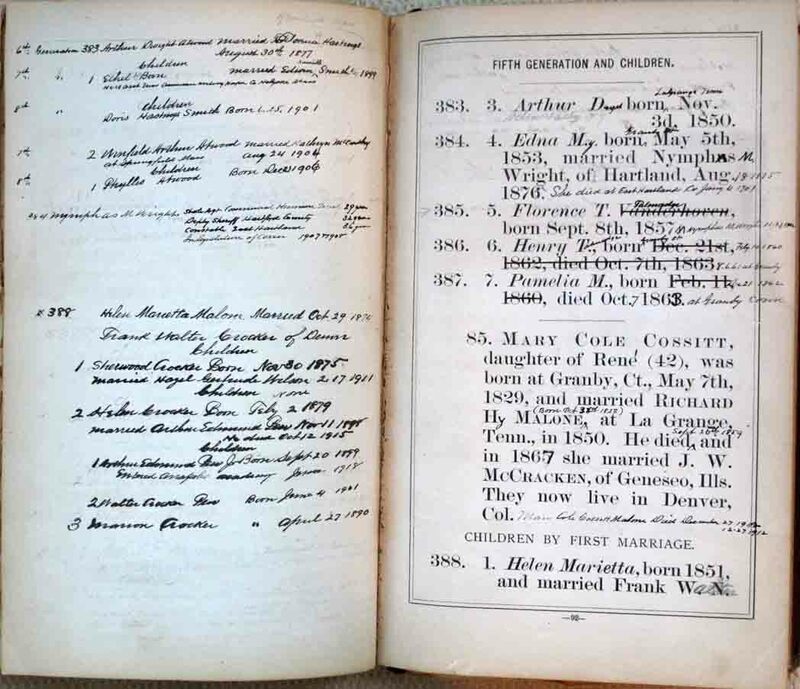 While this writer, the great grandson of Frederick, doubts that he planned another edition, it is noteworthy that Frederick’s copy of the 1925 edition also contains numerous notations, primarily describing marriages and children of people listed in his work. He clearly never lost his interest in the Cossitt family. In short, Frederick Henry White led an active life as a husband and father of five, success in business, family archivist, world traveler and armature photographer. Special thanks go to Cousin Stuart White DDS, PhD for writing this story and furnishing all of the pictures. If you have any additions or corrections, please send us a note at contact/join.